Join us for Trivia Tonight on May 3! March was an active month at Aurora. 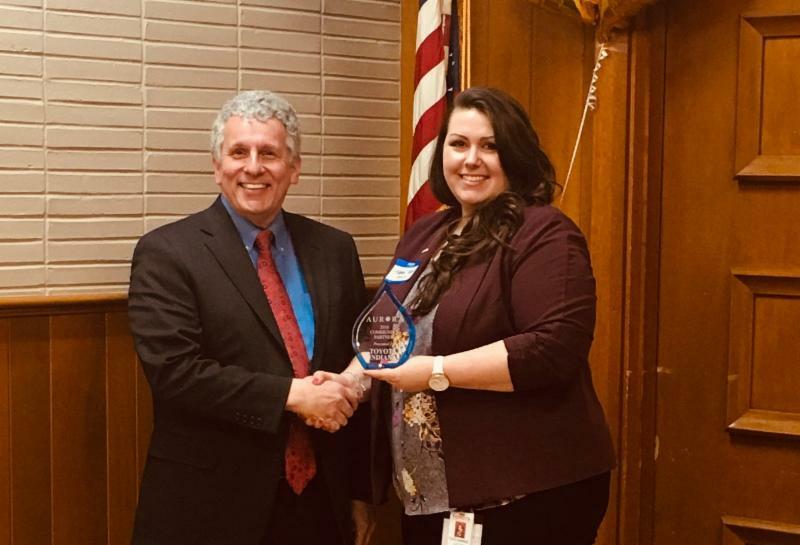 In addition to helping clients obtain stability and housing, our staff sharpened their skills at professional training, helped conduct Homeless Connect of Southwest Indiana, and celebrated the 30th anniversary of our life-changing work for our community. We invite you to join us in our mission. 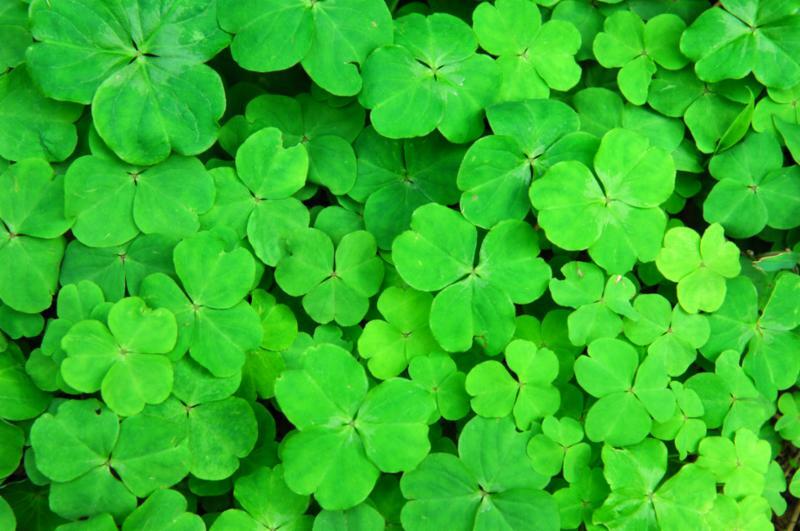 With the arrival of spring, our clients’ needs are changing, too. Learn how you can help below, and consider becoming an Aurora Partner today. It’s a game night, silent auction, dinner, trivia competition and a fundraiser too! 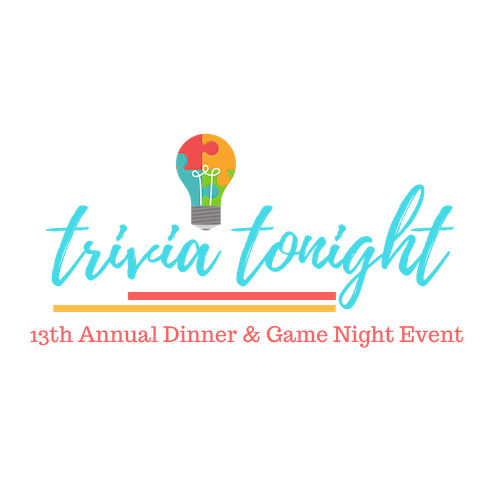 On May 3, 2019, our highly anticipated Trivia Tonight fundraiser returns with its fun and competitive approach to raising money to fight homelessness. Founded in 2006, Aurora’s annual Trivia Tonight is fueled by the spirit of competition and our ability to pull arcane knowledge out of our collective memory banks. Returning to the Evansville Country Club with the erstwhile Tim Black and Scott Wylie as emcees, this year’s event will certainly entertain and inspire. Eight players are allowed per team. Those buying individual tickets will be seated together to create full teams. Last year’s event raised over $35,000 to support Aurora’s programs and we’d like to top that in 2019. Please make your reservation by April 26th! To become a sponsor or purchase your table or tickets, Click Here. On March 15 th, more than 120 special guests joined Aurora at Deaconess Johnson Hall to help us celebrate 30 years of making a difference for those experiencing homelessness. The occasion was our annual Supporter Breakfast sponsored once again by our friends at Deaconess Health System. The inspiring invocation from Scott Cassel, Lead Pastor at The Turning Pointe, set the tone for our event. Mayor Lloyd Winnecke shared in the celebration by proclaiming March 15th “Aurora 30th Anniversary Day” in Evansville. Also on hand were Commission on Homelessness Director Matthew Hanka, Ivy Tech Community College Southwest Chancellor Jonathan Weinzapfel, NAACP Branch President Rev. Gerald Arnold, and other community leaders. Most importantly, the event gave us the opportunity express our thanks to the many organizations, volunteers and individual donors who support our mission. We could not do this work without them. Especially recognized were Toyota Motor Manufacturing Indiana, recipient of the Community Partner Award (Tiffannie Hedin of Toyota, above, accepted); Community Advocate Award recipients Congregations Acting for Justice and Empowerment and their lead organizer Amy DeVries; and Laura Edge, the Shining Star Award winner and our Community Volunteer of the Year. 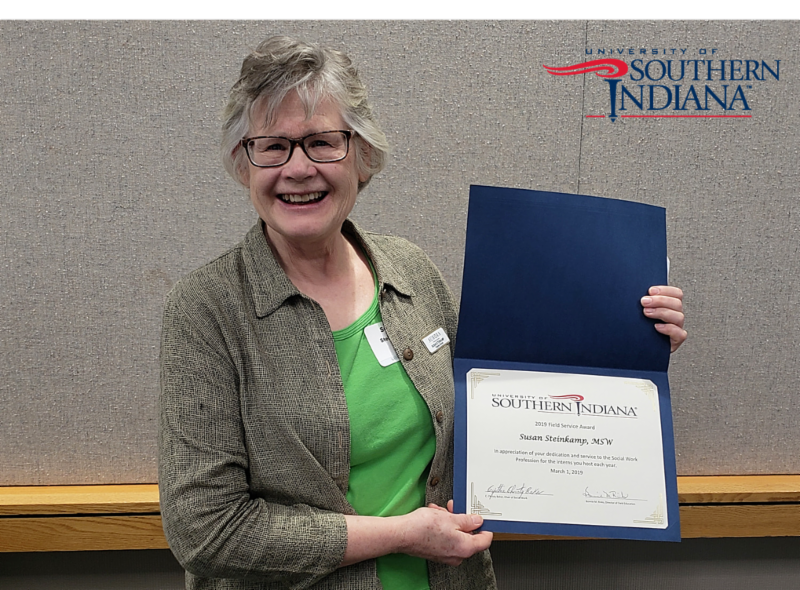 On March 1, 2019, The University of Southern Indiana Department of Social Work honored Aurora’s Program Director Susan Steinkamp as its 2019 Field Service Award recipient. The award is given annually at USI’s Social Work Conference to a social worker who values mentoring and internships. The award states: “In appreciation of your dedication and service to the Social Work profession for the interns you host each year.” Aurora maintains a strong partnership with USI’s Social Work department, annually providing its students internships that give them essential real-world experience in the profession. Many of them convert their experience to full-time employment with Aurora. Susan’s award was a great way to celebrate National Professional Social Work Month, which turns the spotlight on the profession’s important contributions to society. The entire Aurora team participated in the annual Homeless Connect of Southwest Indiana held March 21 at the Old National Events Plaza. Now in its 11 th year, the event gathered more than 100 local agencies to help people experiencing or facing homelessness with employment, haircuts and personal care, educational resources, assistance with affordable housing, legal advice, health screenings and more. Aurora Program Director Susan Steinkamp has participated every year and values the event’s benefits for those who attend. “They can come here and find the help they need instead of going all over the city for hours just for one appointment," she said. “The level of collaboration and interaction between volunteers and agencies staffing the event is amazing. 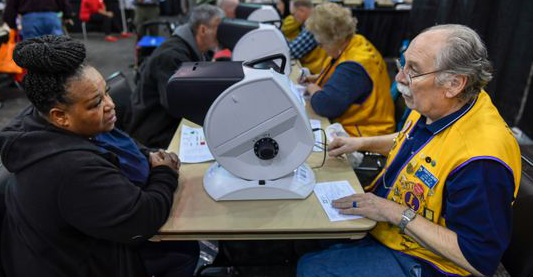 Everybody is looking for ways to make things happen.” In the photo above, East Side Lions Club members provide free eye exams to participants (photo by Mike Lawrence, Evansville Courier & Press). Increasingly, libraries are taking an empathetic approach to patrons experiencing homelessness, offering refuge and support. 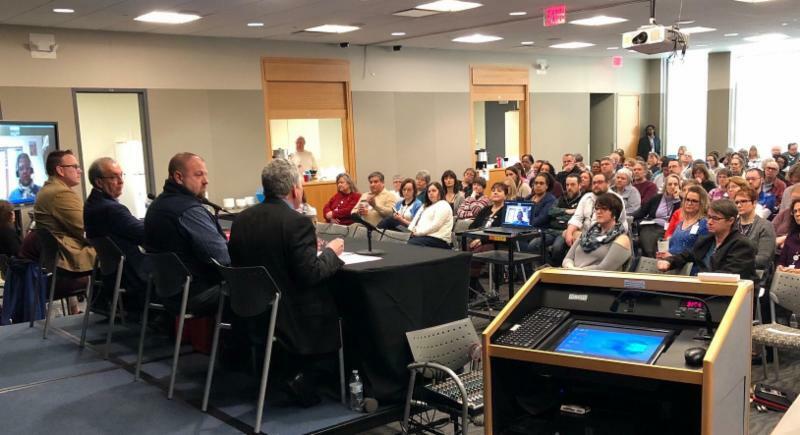 At Evansville Vanderburgh Public Library’s annual Staff Day on March 22nd, Executive Director Timothy Weir participated in a panel discussion exploring the intersection between the library and homelessness. Joining him were Evansville Police Chief Billy Bolin, United Caring Services Executive Director Jason Emmerson, and guest speaker Luis Herrera, who formerly led the San Francisco Public Library. In his compelling talk, Mr. Herrera described integrating the very first library social worker into the San Francisco Public Library system. With EVPL CEO-Director Cyndee Sturgis Landrum’s support, members of Aurora’s homeless outreach team have begun making weekly visits to Central Library to check in with – and help – their clients. Like everyone, people experiencing homelessness use the library for reading, research, internet access, and meeting up with friends. But the library is also a place to escape the weather and get some much needed rest. Spring is here. As the weather warms up, Aurora’s assistance needs are changing and so can your help. Instead of clothing clients with winter coats and gloves, we now need shorts, t-shirts, socks and athletic/walking shoes for men and women. Backpacks and duffle bags are always welcome. They’re a convenient way for our clients to carry and store their belongings. Your cash donations are even more important to us. They help us pay for critical services not covered by grants and restricted funding, from helping clients obtain their birth certificates and pay for insurance to purchasing bus tokens. Want to help? Become an Aurora Partner by giving monthly. 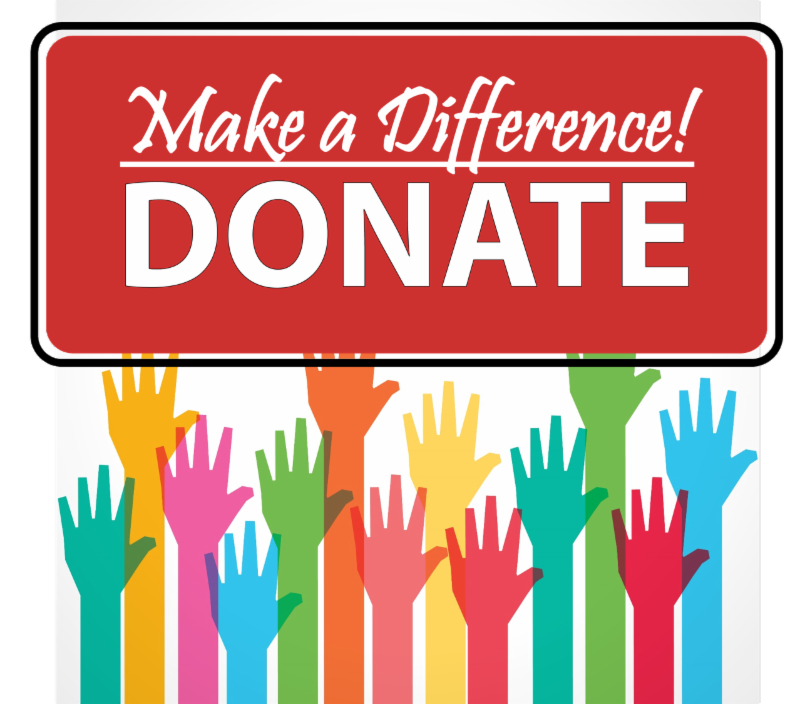 You can donate three ways: via our secure webpage – Click Here – by calling (812) 428-3246 or emailing us at adavis@auroraevansville.org .